Learn how to stand up paddleboard with us this summer! Our 2.5 hour intro course teaches you the basic skills and knowledge to safely paddle in calm sheltered waters. Skills covered include mounting, kneeling, standing on a board, forward and turning strokes, safety awareness, carrying and loading boards, and more! 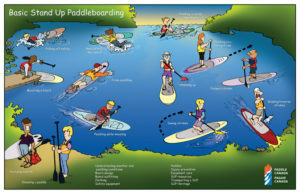 Paddlers will be awarded with the Paddle Canada Basic SUP Certification, which prepares you for our other stand up paddleboarding skills courses, such as our advanced flatwater SUP skills course. Intro courses run every Wednesday and Thursday all summer long! Course runs from 6:00 pm to 8:30 pm. Please arrive about 15 minutes early, so that you are unloaded, changed, and ready to begin at the start time. Arriving late will cut into your instructional time, and that of others on the course. This course will run with a minimum of 2 students and maximum of 6 students per instructor. Course Cancellation: It is rare that we cancel a session due to weather considerations however we will do so if, in our judgement, the conditions are dangerous or are likely to present a poor learning environment. We provide the technical paddling gear that you will need for the course as part of your course costs. That means no additional rental fees on top of the course fee! For warmer season/conditions: quick-dry outdoor athletic gear such as paddling tops, rashguards, breathable hiking layers, merino wool, boardshorts, athletic swimwear. No jeans or cotton! For colder season/conditions: We recommend a shorty style neoprene wetsuit or neoprene paddling top combined with neoprene shorts or pants. Insulating layers, weatherproof shell layers. Towel and warm, dry change of clothes. Secure protective footwear such as water shoes, paddling shoes/booties, or sport sandals. Hat, sunscreen, and sunglasses with straps. Any personal first aid, medications, etc. Contact us if you have any questions regarding gear.